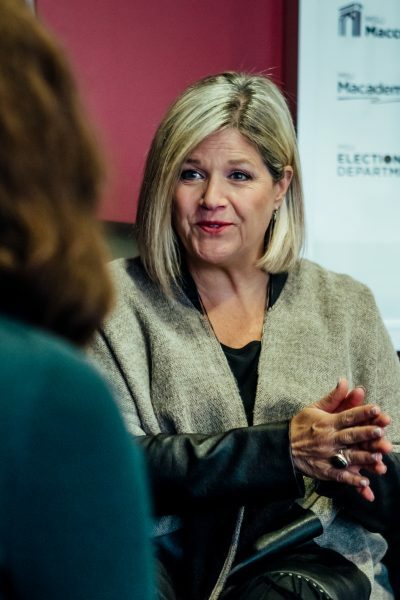 On Jan. 25, The Silhouette sat down with Ontario New Democratic Party leader Andrea Horwath to discuss the Ford government’s recently announced changes to Ontario’s tuition framework, financial aid system and student fees. On Jan. 17, the Ford government announced a 10 per cent reduction in the up front cost of tuition in Ontario. This came alongside a plan to tighten the eligibility requirements for the Ontario student assistance program, reduce grant money offered by OSAP and eliminate the six month grace period before loans must be paid back. According to Horwath, the 10 per cent tuition cost reduction will end up harming students. “This decision that the government’s made is deceitful first and foremost because the 10 per cent sticker price announcement really means nothing for affordability for students,” she stated. Horwath said the proposed changes would cause students to graduate with more debt and pay higher interest fees. The McMaster Students Union has expressed similar concerns. “Grants are a far more effective form of student financial aid than loans. Rolling back OSAP eligibility and increasing the loan threshold will increase the debt load on many students,” said Ikram Farah, MSU president. According to Horwath, the requirement of an opt-out for non-essential student union fees is a strategy to silence the voices of students. “I think a lot of what the government is trying to do is weaken the student movement to silence the voices of young people,” she said. The MSU released a statement saying that this provision might impact the advocacy abilities of student unions and provision of services and supports. “The potential of optional fee structures for services could severely undermine the ability of students to organize and maintain robust student-oriented provisions, along with their representation to all levels of government,” stated the release. According to Horwath, the proposed changes to tuition, fees and OSAP will impact more than just students because all Ontarians benefit from well-functioning post secondary institutions. She explained that weakening the student experience on campus, lowering the quality of education and burdening students with more financial distress mean that young people will not get the education that they need in order to participate in the workforce. The Progressive Conservative party holds a 60 per cent majority, meaning that they have enough seats to pass legislation without the assent of other parties. Despite this, Horwath believes it is still possible to advocate for change. She noted that as a result of public outcry, the Ford government recently backtracked on a proposal open up the Greenbelt to developers. According to Horwath, this demonstrates that broad resistance from Ontarians is key. Hannah is in her fifth-ish year of Environmental Science and JPPL. Her favourite place to study is the downtown Public Library. She is a big fan of politics, visual arts, long-distance biking and plants.